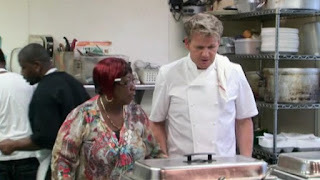 In this Kitchen Nightmares episode, Chef Gordon Ramsay visits Ms Jean's Southern Cuisine in Wilkinsburg, Pennsylvania, opened 12 years ago by retired teacher Jean Gould. When customers complain Jean argues with them and accuses them of lying. She is deep in debt and the restaurant is empty most nights. Jean approaches Gordon at his hotel with a peach cobbler in one hand and says her biggest problems are the staff. Gordon arrives at the restaurant and there is nobody there to greet him. Gordon orders the pork chops, ribs and mac and cheese. His iced tea is “like sugar syrup” and he sends it back so he gets up for a walk about and finds Ms Jeans exercise bike in the corridor. The ribs, have a weird saltiness,the mac and cheese arrives still sizzling from the microwave and is bland and overcooked. The pork chop is greasy and looks sad on a plate alone, it is also as dry as a mouthful of sand. Ms Jean tastes the dishes he returns and says he doesn’t know anything about soul food. Gordon returns for a dinner service and compares the reception to a waiting room at a doctors surgery. There is chaos in the kitchen as the orders are stuck on the fridge and Jean attempts to control the kitchen but the servers decide they are going to do their own thing. Surprisingly the food gets out to the dining room but the customers are not impressed. Gordon ventures out to reception to find the hostess on the cell phone and after an exchange she quits. Gordon notices that a lot of chicken is being returned to the kitchen and discovers that the chicken is leftover from lunch. Jean breaks down in a big way, you can see how much her staff care. Gordon takes Jean and her staff to a theatre to show them “The Other Side of Ms Jean”, a film by customers who won't return as she does not treat them well. Jean apologises to everyone and promises that she is a new Ms Jean. Gordon gives the restaurant a huge makeover nearly doubling the capacity. Gordon also changes the menu to southern comfort food with a fun twist, they sample the menu and are delighted with it. For relaunch night, the Mayor comes out and Gordon puts Jean in charge of the kitchen. The staff respond well to the new leadership and new system. Appetisers make their way out to the customers quickly and everyone including the Mayor is impressed with the new food. The front of house lets down the service and the servers are under pressure. Gordon stops the service temporarily and Jean gives Marissa a pep talk. Gordon chats to them all after service and declares that “Ms Mean” has left the building. In the following days, the Mayor awarded Jean for her years of service to the community and June 3rd was declared Ms Jeans day. Ms Jeans is still open as Jean's Southern Cuisine but has moved to a new location, 807 Wallace Avenue, Wilkinsburg PA 15221. Reviews are mixed, Yelp reviews are average. Planning a visit? Check out the website for opening hours and more info. Ms Jean's Southern Cuisine was aired on November 16 2012, the episode was filmed in May/June 2012 and is Kitchen Nightmares season 6 episode 4. I just drove past Ms. Jean's Southern Cuisine today in Wilkinsburg. Sadly it is no longer open. From what I understand they went back to the old menu and then they closed. I have lived in Pittsburgh all my life and, unfortunately Wilkinsburg is one of the most depressed areas near (technically not in) the city. Nothing short of a miracle would keep a restaurant open in this location. There are at least a hundred restaurants in Pittsburgh that Gordon could have had a success story with. The show should look around a little more when they pick the spots to fix up. I'd really like to try a restaurant that has been on KN but I don't want to drive 100+ miles to do it. So many of these restaurants seem to want to get on the show for publicity but not actually take the advice. I wish they would have done one of those shots showing Gordon driving up to the place on the street, that way everyone could see - no amount of publicity would make people want to park their car in this neighborhood at night. If you're not from Wilkinsburg, you're not going to go there to eat at a restaurant. They showed Gordon coming out of the William Penn Hotel downtown and he probably drove past dozens of better candidates on the way. Such a shame. NOBODY expects 100% of restaurants to succeed. if Gordon can get at least ONE restaurant back from black, one is more than NONE. face it, they were on their way out before they got on the show. and OF COURSE, if he had gotten there SOONER, the odds would be better! Gordon is loved, at least he tries- what did YOU DO TO HELP? Considering that the success rate would probably be 0% without Ramsay, I think you're being just a teensy bit unfair to the guy. Just watched the episode here in Hong Kong on our cable box. BBC channel. I have seen most of his shows, both UK & US. Gordon shows all rest operators and owner the way. From your list 80% are closed. And now it seems Ms Jeans has done the same or what I see on line moved location. Gordon made her a new rest and menu. Yet from what you all say, changed back to the old "cant make money-bad unsellable food" way. Why do owners do that?? Why do they not follow Gordons rules??. Once they get to try Gordons new menu. they all say Oh My. So why?? Even watching Ms jeans, the entire staff say the food is out of this world. Can someone tell me why go back and not forward. Im using windows 7. Not 3.1 from 20yrs. My computer will never work. Maybe it will just send emails and play games. I hope all future rest owners seeking help from an expert, FOLLOW IT! Gordon has been expending. New cook books, new shows, new restaurant's around the world etc.. Yet they call Ramsey for help. Why?? Anyway, I hope I can get your opion and comment's on all this. Another programme I love is Bar Rescue. I'm a DJ and my Gf is a head cook. We both go all out in making sure we deliver 1000%.. When it comes to shows like these, you have to realize that they need help for a reason. They got into the positions that they are because they have absolutely no business and opening a business. Lol! A lot of the time they open a bar because they like to drink, they open a restaurant because they like to eat. Those are not valid reasons to open businesses. You cannot expect anyone to be able to save someone who is in some cases millions of dollars in debt because usually ego is at play. You have owners who rarely know nothing more than how to eat, megalomaniac chefs and worthless staff. Most places are mere months from closing when he shows up. You can only hold creditors off for so long. Granted I have only seen 1/4 of the total episodes on that list (thus far) but this was by far the most shocking & depressing "restaurant". It looked like a shelter for homeless. Such restaurants exist in Pittsburgh? Why was the greeter at the front (always on cell phone) a helper? Was hoping Gordon would question this. Anyhow I assume the answer to "Why do owners return to the old menus" is 2-sided. Usually the regulars return demanding their favorite classic plates. But I fear the reason establishments like Ms.Jean go back to old ways is simply lack of supplies. This was the first episode which didn't include Gordon investigating the freezer/supply room. I think that is very telling. Remember he tried ordering and most of the plates on the menu were out? And what they managed to serve looked like low quality TV dinners. Quick search on Yelp shows she now runs a Buffet with hit & miss results. I see photos (None of Ramsey's makeover objects around) and am still amazed such a place still exists. No standards in Pittsburgh? Wilkinsburg isn't properly in the city; it's an adjacent area that is severely economically depressed. It doesn't have anything to do with the "standards in Pittsburgh" as a whole. The shots of the city were probably used to make the episode look more appealing than shots of Wilkinsburg itself would look. Wilkinsburg...? Let's call it by what it's ACTUALLY know around here: 'Will-kill-yinz-burgh' --it's the hood. Plain and simple, it's staffed and run by exactly who you'd expect: The entitled class. "Plain and simple, it's staffed and run by exactly who you'd expect: The entitled class." Oh, I didn't see any white millennials there. Despite being a white millenial, I LOLed at that comment. Where can i find the episode at? I live in Pittsburgh... And like many other folks. Who see things close to home. I'd love to see this episode!!! The joke isn't Ramsay it's the restaurant owners. If you look at some of these restaurants that closed after he tried to help it's because they go back to the old ways. If I had someone like Ramsay to help me I would be bending over backwards and listening to every word he uttered. Not to mention after seeing how dirty and disgusting these restaurants are to begin with would you eat there after Ramsay was gone. They dug their graves and buried themselves. Ramsay would have to be a certified miracle worker to help them. I don't know how anyone can say that Ramsay didn't help. Most of these restaurants would probably be closed in less than 6 months without him and because of him managed to stay open for a year or longer. It goes back to that old saying "you can lead a horse to water but you can't make it drink". He gave them the tools if they chose not to use them then shame on them. You are right to an extent, but I think that restaurant owners that do what you say you would do , and that is swallow your pride, listen to your staff and customers and consider and accept change, probably wouldn't be in the position that the restaurants in the show are in and wouldn't need the sort of help that he offers. What can you say about chef Ramsey is that he knows his stuff and he tries, but he does make mistakes, but he does have the courage to admit them, even on the show. That says a lot about a person. I wonder how many go on the show just to Up Their Profile so they can turn around and sell it for more than they would have without having been on Kitchen Nightmare. Because Several of the Restaurants he tried to help sold within months of the shows airing. Some did close due to gross incompetence. 2. A Clean Restaurant and Kitchen. 3. Food properly labeled and stored properly. 5. Making sure the outside looks nice. Ugly exteriors will cause people to walk or drive by said establishment. 6. If a customer wanted canned or frozen food they would have stayed home. 7. Fix equipment as quickly as possible. Broken equipment may cost a bit up front but it could be even more costly down the line. 8. Never yell at Employees or Customers. This is the worst P.R and word will spread and people WILL stop coming to said restaurant. 9. If a customer complains, deal with it quickly and politely. Don't ARGUE! Only MORONS argue with the Customer. 10. Some study cooking BUT how many Future Restaurant Owners have brain enough to take a business course or two? I know one Restaurant Owner on KN HAD Studied Business for two years BUT she never studied Cooking. It CAN'T be one or the other. It HAS to be both! 11. Know EVERY job in the Restaurant from Dishwasher To Waitress/Waiter to Manager To Head Chef. One of the more bizarre episodes. I guess they just wanted to show that Ramsay could cook soul food. We never got a kitchen walk through. We never saw Ramsay training the kitchen staff. Miss Jean and the staff were the stars of the show - it felt like Ramsay was making a guest appearance on a sitcom. This may be because their walk-in situation might've been decent. Gordon said 2/3 of the menu wasn't available during his first meal there so that means they probably aren't hoarding lots of spoiled or frozen food. Also the kitchen staff seemed to be getting the food out at a good pace even though their style was a bit unorthodox so he may not have had to train them up so hard. Ramsay has managed to save these restaurants at about a rate of 40%. That's pretty good considering over 75% fail in the first year and many of the owners featured on KN have no business running a bath, let alone a restaurant. There are a few comments above about how some ask Gordon in to help rebuild credibility and then sell it off. That's been the case with a number of them. National television, local news, celebrity chef, and a six figure remodel to boot? If I was a half-million in debt and found a way out from under the rock, you can't exactly blame them. Do you have any idea how long it takes to recoup that much money in any business, let alone one that has such high overhead? If you think you can, you are stupider than Vic from the "Fiesta Sunrise" episode, and that guy was one thick brick! OMG some of you people feel like Gordon Ramsey is the kiss of death because of the restaurants have closed after the show aired. Those establishments were in DEEP trouble before the show. Most of them were run by idiots who had no business running a business. The man may be arrogant but he's obviously brilliant. He owns dozens of award winning restaurants . Just watched it on FYI. My thoughts on the show is that no owner ever listens. If Ramsey is having personal success at his restaurants, he knows what time it is. You either take advantage or you don't. I don't know how they're still open. They're only open four days out if the week, in a weird part of the city, and are only open from 11.30-7. Are you're eyes open. Do you guys see what he's walking into. I guess he shall just leave the rats the mildew growth mold. Leave family's hateing each other. All while the customer pays for it all. None of you have an idea how hard it is to love to serve someone else. From Hi too Thank You for coming just those words alone people find hard to say. Most of the restaurants that Gordon goes to are already too far in debt to bounce back and be successful. I'm glad this one is still open. I loved the younger waitress, she had a calm air to her and I loved the family vibe the staff exhibited. Even though Ms.Jean could be nasty, they always had a prayer at the ready for her and support.